Classic shaped clear PET plastic juice bottle with 34mm neck. An easy fill wide neck. Great for freshly squeezed fruit juices and home made smoothies. Buy in single or bulk, the choice is yours! 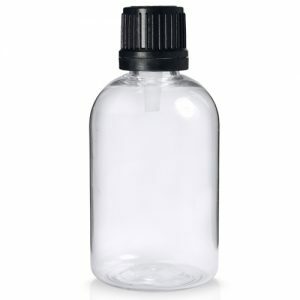 Classic shaped 250ml clear PET plastic juice bottle. A popular choice with our juice customers. The straight sides make adding your own label easy! The clear PET plastic offers maximum clarity and enhancement to the natural colours of your product. If you run a drinks company or sell your produce in farm shops or at food markets, these bottles are great for packaging your fruit juices, smoothies, milkshakes, vitamin shakes and other soft drinks. With no minimum order requirement, you can even order one or two bottles for use at home.